The blog known as Comics, Old Time Radio & Other Cool Stuff selected one of my all-time favorite radio shows as one of its recent Friday's Favorite OTR: Candy Matson: "San Juan Batista." The full title of the show was Candy Matson, Yukon-28209, with the latter part of the title representing the heroine's telephone number. The shows always started with a phone ringing, and Candy answering "Hello, Yukon 28209. . . . Yes, this is Candy Matson." 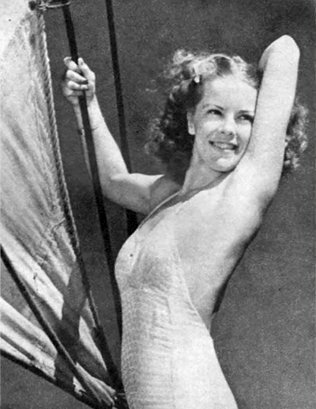 Candy was a former dancer/model/showgirl who became a private investigator in San Francisco. Voiced by Natalie Masters (above), Candy solved crimes while exchanging witty, rapid fire dialogue with her pal Rembrandt Watson, and her eventual beau, SFPD Detective Ray Mallard. The dialogue is one of the reasons this show is one of my favorites. In one episode, while Mallard and Rembrandt are bantering about with increasingly bad puns, Candy sighs something to the effect of "Who writes this corny dialogue?" Aside from the obvious joke, the actual writer was Natalie Masters' husband, Marty Masters. This morning's Sunrise Serenade was "The Third Man Theme" by Guy Lombardo and His Royal Canadians. Click on the song title to listen courtesy of Jazz On Line. I've seen this one before, but it has been a really long time. This 1939 Warner Bros. short features the story of one prisoner's escape from Alcarazz prison, with a little parody musical number toward the end. Here is Bars And Stripes Forever. This morning's Sunrise Serenade was "It Don't Mean A Thing (If It Ain't Got That Swing)" by the Boswell Sisters. Enjoy the video from YouTube. Today's Sunrise Serenade was "Hawaiian War Chant" by Tommy Dorsey and His Orchestra. Click on the song title to listen courtesy of Jazz On Line. The playlist for the April 25, 2018 broadcast of the Swing Shift Shuffle has now been added to the playlist filing cabinet. This morning's Sunrise Serenade was "I'll Always Be In Love With You" by Ella Fitzgerald. Enjoy the video from YouTube. 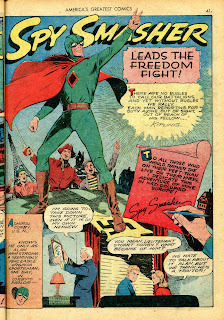 I thought I had already posted an adventure of Spy Smasher, but on second look, I could not find one, so here is one from 1942. Posted on Four Color Shadows, Spy Smasher journeys to occupied Paris looking for an American traitor, only to find a Resistance hero! The dialogue is a little over-the-top, even for the 1940's, but the plot is not bad. 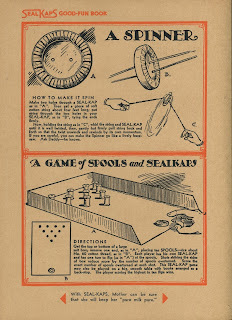 Here is a fun little item, posted on Dull Tool Dim Bulb, brought to you from the American Sealkap Corporation. 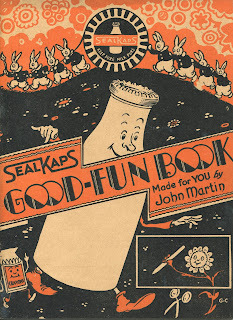 The book contains instructions for various activities and craft projects using SealKap bottle caps. This morning's Sunrise Serenade was "I'm Putting All My Eggs In One Basket" by Fred Astaire. Click on the song title to listen courtesy of Jazz On Line. The playlist for the April 18, 2018 broadcast of the Swing Shift Shuffle - Spring Pledge Drive Special: 1938 - has now been added to the playlist filing cabinet. Spring Pledge Drive Special - 1938 - Tonight! WEVL (home of the SSS) is in the middle of its Spring Pledge Drive. This event is one of our two big fundraisers to keep the station operating. With no outside backing, and no advertising on air, we rely on our members to keep us on the air. So call the station at 901-528-1990 to make your pledge of support, or do so securely online at wevl.org. The SSS Pledge Drive Special will be 1938, and I will play the hits of that year as documented in The Billboard magazine. Yes folks, that is Lawrence Welk on the December 3, 1938 cover. Today's Sunrise Serenade was "My Fine Feathered Friend" by Alice Faye. Enjoy the video from YouTube. I stumbled across this old favorite of mine featuring the Dover Boys and their arch rival, Dan Backslide. This Warner Bros. gem from 1942 was directed by legendary animator, Chuck Jones. From YouTube, here is The Dover Boys At Pimento University (or the Rivals of Roquefort Hall). This morning's Sunrise Serenade was "El Choclo" by Stan Kenton and His Orchestra. Click on the song title to listen courtesy of Jazz On Line. Today's Sunrise Serenade was "I Got Rhythm" by Valaida Snow. Click on the song title to listen courtesy of Jazz On Line. The playlist for the April 11, 2018 broadcast of the Swing Shift Shuffle has now been added to the playlist filing cabinet. This morning's Sunrise Serenade was "Stormy Weather" by Lena Horne. Click on the song title to listen courtesy of Jazz On Line. Before the 1950's, motorcycles did not have as much of an "outlaw" image as in later years, and they were often just an alternative form of transportation, not a vehicle of rebellion or rich folk's toy. 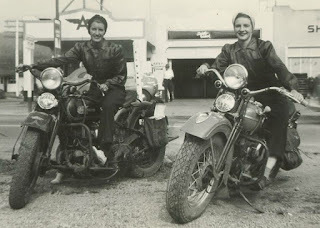 Here we have a photo, posted on Rivet Head, of two ladies and their Harley Davidsons in the 1940's. Today's Sunrise Serenade was "Bei Mir Bist Du Schon" by the Andrews Sisters. Click on the song title to listen courtesy of Jazz On Line. 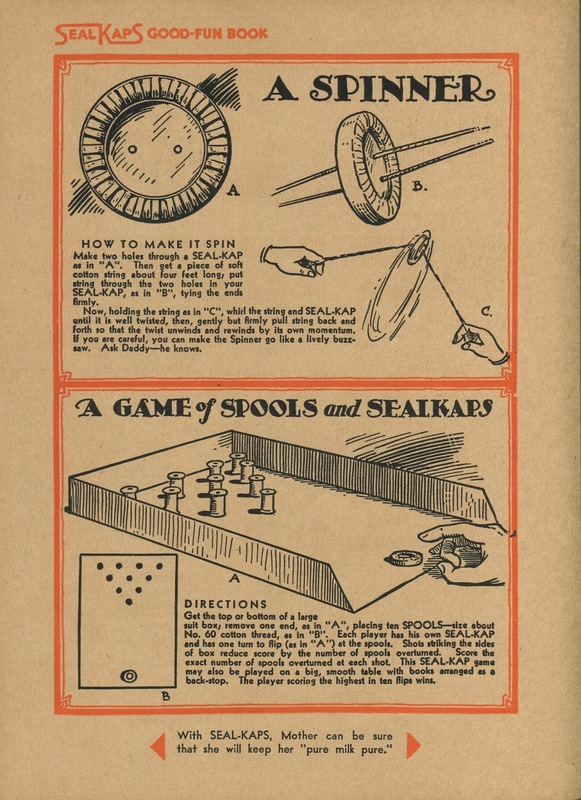 Sarah Sundin posted another item in her "Make It Do" series of life on the home front in World War II. Processed food was rationed during WWII not only because the military needed the food, it needed the tin in which the food was stored. 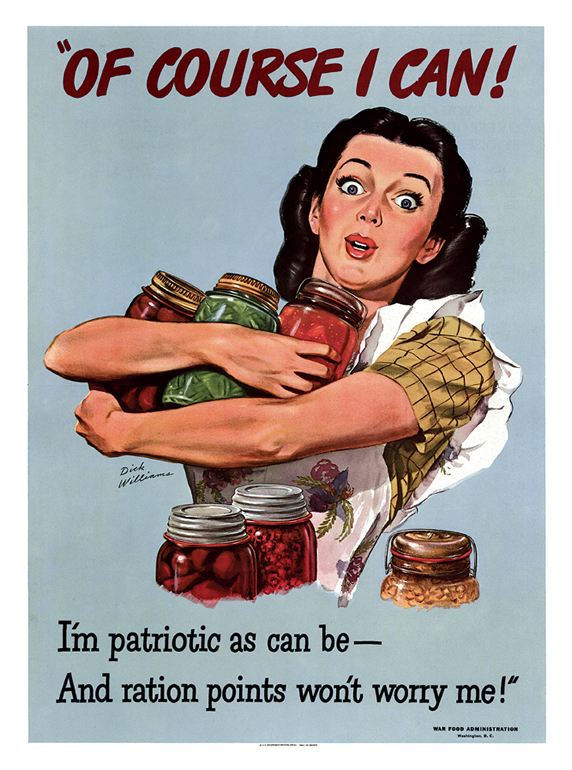 As a result, canning was an important way for households to preserve food they had grown in their Victory Gardens, and thus save tin and ration points. I've always wondered why it is called "canning," when I have never seen cans used. Home preserved food is kept in jars. Perhaps it sounded weird to say that one was "jarring." Sunrise Serenade: How D'Ya Like To Love Me? This morning's Sunrise Serenade was "How D'Ya Like To Love Me?" 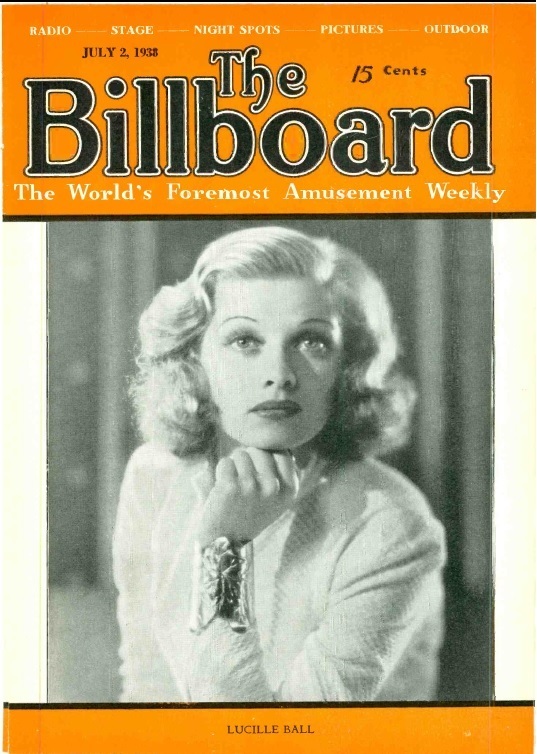 by Glenn Miller and His Orchestra. Enjoy the video from YouTube. This morning's Sunrise Serenade was "Is You Is Or Is You Ain't My Baby?" by Bing Crosby and the Andrews Sisters. Click on the song title to listen courtesy of Jazz On Line. 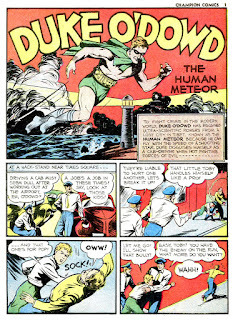 I don't remember seeing this hero before, so when Pappy's Golden Age Comics Blogzine posted this 1940 story of "Duke O'Dowd: The Human Meteor," it seemed worth a post. 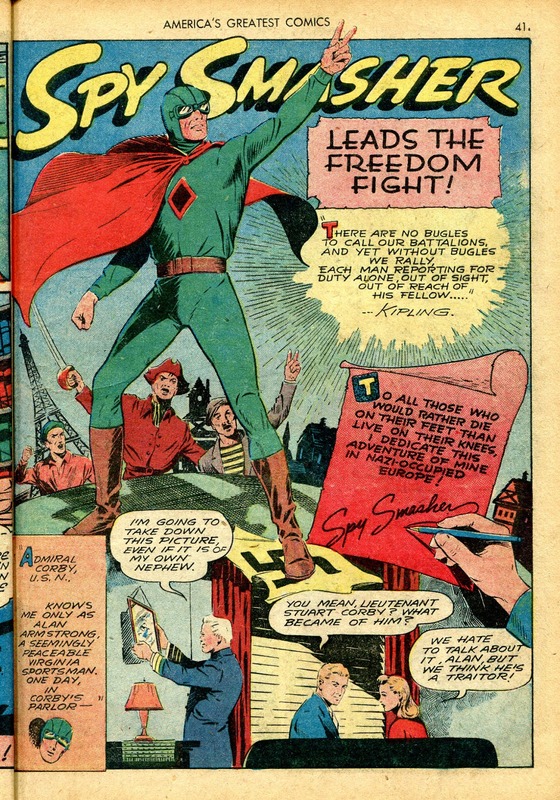 Apparently, his primary power is high-speed flying, when he is not driving a cab in his secret identity. Today's Sunrise Serenade was "My Old Man" by the Spirits of Rhythm. Click on the song title to listen courtesy of Jazz On Line. The playlist for the April 4, 2018 broadcast of the Swing Shift Shuffle has now been added to the playlist filing cabinet. This morning's Sunrise Serenade was "More Than You Know" by Erskine Hawkins and His Orchestra with Dolores Brown on vocals. Click on the song title to listen courtesy of Jazz On Line. Red Hot Lindy Hop is excited to welcome back Elizabeth Wise to the Rumba Room for our first Saturday dance on April 7! Elizabeth leads bands in Boston, New York City, Memphis, and Richmond, and her quartet brings their own brand of "swinging, sassy blues" for your dancing pleasure. Today's Sunrise Serenade was "You Turned The Tables On Me" by Ella Fitzgerald and the Daydreamers. Click on the song title to listen courtesy of Jazz On Line. Benny Goodman's "Rattle And Roll"
This article, posted on Swing and Beyond, provides a brief snapshot of Benny Goodman's career in the early 1940's, during and after World War II. 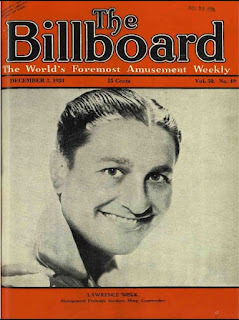 Apparently, the music that made BG the King of Swing in the late 1930's was beginning to seem a bit "old hat" to audiences of the day, and this post explains how Goodman and his band evolved to address that challenge, including recording tunes like "Rattle and Roll." This morning's Sunrise Serenade was "Body And Soul" by the Benny Goodman Trio. Click on the song title to listen courtesy of Jazz On Line.